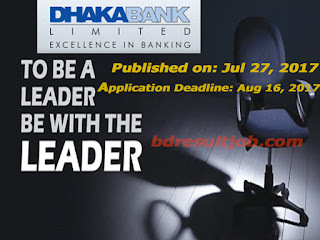 Dhaka Bank Limited job circular 2017 has been published. If you want to apply for this job, you should submit your application within 16 August 2017. Dhaka Bank Limited job circular 2017 has been given bellow. Candidates with Bachelor of Engineering (CSE/EEE/Civil/Mechanical) from BUET or BBA from IBA, DU with three first division/class/equivalent CGPA are also eligible to apply. 5. Age: Age should not exceed 30 years as on 16th August 2017. 7. Terms and condition: Before joining, Management Trainee Officer (MTO ) and Trainee Officer (TO) must give Training & Development Bond for serving the Bank for a minimum of five years including the trainee period. 8. Selection Process: Only short listed candidate will be called for the written test. Based on merit, selective applicants will be asked to face interview. 9. Last date of apply: 16th August 2017. 3. The candidates must have Post Graduation in any of the following disciplines from a reputed university having no third division/class/equivalent CGPA in their educational career. Tags: Bank Job 2017, Career Dhaka Bank 2016, Career Dhaka Bank 2017, DBL Job Circular 2016, DBL Job Circular 2017, Dhaka Bank Job Circular 2016, Dhaka Bank Job Circular 2017, Dhaka Bank Job Management Trainee Officer (MTO) Trainee Officer (TO) Trainee Cash Officer (TCO), Dhaka Bank Job Trainee Cash Officer (TCO), Dhaka Bank Job Trainee Officer (TO), Dhaka Bank Management Trainee Officer (MTO), Dhaka Bank New Job Circular 2016, dhakabankltd.com/career, Management Trainee Officer (MTO) Dhaka Bank, Trainee Officer (TO), www.bdjobs.com.